The ancient Olive tree is renowned for its tasty fruit and oil. Less well-known are the many culinary uses of it’s leaves. Ground Olive leaves can be added to smoothies, fruit and vegetable juices, savoury dishes, sauces, pestos, salad dressings, breakfast cereals, and bread and pasta doughs. Olive leaves infused in hot water are drunk as a tea. Unlike ordinary Olive leaf products, this superior Olive Leaf is prepared using a unique, gentle, patent-protected process which means it is rich in oleuropein. Olive leaf extract (d-calcium elenolate). Encapsulated with natural ingredients; hypromellose. Take 1-2 capsules up to 4 times a day, 30 minutes before meals or 2 hours after meals, building gradually. 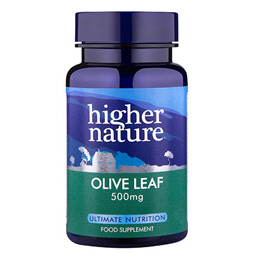 Below are reviews of Olive Leaf Extract - 90 x 500mg Vegicaps by bodykind customers. If you have tried this product we'd love to hear what you think so please leave a review. Higher Nature Olive Leaf Extract - Unlike ordinary Olive leaf products, this superior Olive Leaf is prepared using a unique, gentle, patent-protected process, which preserves more of its natural components.